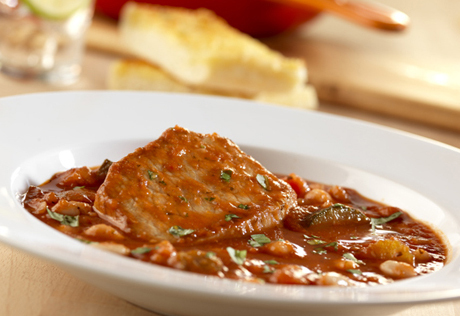 Here's a great dish that tastes like it was made in a Tuscan country kitchen - it features tender pork chops with white beans and tomato sauce served with slices of mozzarella-garlic bread. Heat 3 tablespoons of the oil in a 6-quart saucepot over medium-high heat. Add the pork and cook until it's well browned on both sides. Remove the pork from the saucepot. Heat the remaining oil in the saucepot over medium heat. Add the garlic and onion and cook for 3 minutes or until the onion is tender. Preheat the oven to 400°F. for the bread. Return the pork to the saucepot. Stir the sauce in the saucepot and heat to a boil. Reduce the heat to low. Cover and cook for 20 minutes or until the pork is cooked through. Stir in the beans and cook until the mixture is hot and bubbling. Sprinkle the pork mixture with the basil. Cut the bread into 2-inch diagonal slices. Serve the bread with the pork.